Harrogate CC lost for only the second time this season in Division One of the York Senior League when they went down by 38 runs at home to Carlton Towers. The Roosters remain second in the table despite the loss, but now find themselves 66 point behind leaders Sheriff Hutton Bridge 2nds. Garrick Eckard (5-33) and Ben Bartlett (4-50) looked to have given the Roosters the advantage at the halfway stage as visitors were all out for 189. George Hampson (42) made a valiant effort to keep the hosts on track in reply, but they could only reach 151 . Ripon suffered a huge blow, losing out to relegation rivals Dringhouses and dropping to the foot of the table. In a low-scoring affair, Mike Ainsley’s team made just 136/8 despite an unbeaten half-century from Mike Morton (51 not out). Daniel Crewe (3-25) then managed to take three wickets for the away side, but they were unable to defend their total, eventually losing out by a four-wicket margin. Identical half-centuries by Dave Girling and Graeme Whiles guided Knaresborough to a comprehensive success over Sewerby. Both men contributed scores of 76 in the hosts’ 268/8 batting first. Skipper Andy Ward Jr (3-24) and Jordan Tear (3-37) then impressed with the ball to get rid of the cliff-top club for 174. 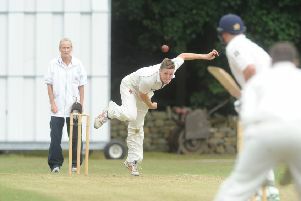 In Galtres Division Two, Sessay 2nds visited Tadcaster Magnets and found Matt Ball in excellent touch. He made 106 in his team’s total of 195/9 despite three wickets each for Lee Margerison (3-37) and James Skelton (3-45). Skelton then batted throughout Sessay’s response, making 82 not out, but despite this and runs from Tom Wilkinson (34), Taddy’s total proved just out of reach as Rory Coe took 4-34 and the visitors closed on 177/8 to take a draw. Rob Ellis went past 700 runs for the season and made his second century of 2018, striking 143 in Pannal’s first innings total of 312/4 against visiting Bilton in Ainsty. John Strover also made a century (101) and with Andy Ellis adding 34, the hosts looked well set at the interval. Miles Lloyd was however to become the third centurion of the match, hitting 108 not out alongside Rob Hildreth (44) as Bilton made a good fist of their chase. Despite their efforts, they couldn’t quite get over the line, but managed to hold out for a well-earned draw at 277/9. Toby Wells (3-13) was again among the wickets when Thorp Arch & Boston Spa entertained Rowntrees & Huntington. The away score of 152 all out proved to be no challenge for TABS and they raced to victory in the 23rd over with runs from George Gibson (56 not out), Andy Jones (55) and Adam Gough (30). Knocks from Dan Magee (66), Tom Scott (63) and Josh Howes (26) saw Thirsk to 206/ 8 at the close and a share of the spoils at home to Easingwold 2nds. Earlier, the visitors had made their way to 251/7, James Hunt the pick of the home attack with 2-18. Studley Royal slipped down to fifth spot in the Premier Division standings as Easingwold rgistered only their third league triumph of the campaign. There was a century for James Clarkson who scored 102 in the visitors’ total of 221/6 which also included 63 from Matthew Coad, who would later take three wickets. He was however unable stop Easingwold from reaching their victory target with four wickets in hand.